STRIDIAN 2016 is an initial outbound camping event which is organized by Mora Hiking Club of University of Moratuwa with cooperation of the University Explorers Club of University of Peradeniya. This is to fulfil the club objectives of the Mora Hiking Club by sharing experience and knowledge with another fraternal organizations. This camping event consists of challenges, fun items and learning opportunities for the members in an impressive manner. Five groups with seven in each, i.e. total of 35 members from Mora Hiking Club, selected through a pre-workshop conducted within university premises, will be eligible to participate in this event. Outbound event will be held on 11th and 12th of December 2016, starting from the Peradeniya university premises. First day, event is scheduled to end up at the camping site located in Hanthana area; and the closing ceremony at the end of second day will have participation of the responsible parties of the both universities. The 3rd surprize event organized by Mora Hiking Club during its formation was Exploring Alagalla. It was new experience for our gang, and that was not an easy task. we start our journey early morning around 4.00am at university premises. we travelled Piliyandala Navinna, Kalaniya via Ambepussa. we got our breakfast at Ambepussa. After getting the breakfast we started our journy to Poththapitiya with fresh mind. We should turn left to poththapitiya Kadugannawa road at Kadugannawa. We came to Poththapitiya town around 9.00 am. There we had a little discussion with our crew, then we started our hike in-front of the tea factory at Poththapitiya. This hike is not easy because there are many chances to get slipped. There are also plenty of leeches. We felt lot of attacks by those leeches. After passing this leeches area we enter the open area. There is 5,6 feet height mana growing in this area. There were two paths to this hike. One was relatively easy as it was about 50ft climb along a rocky slope which is not so difficult. after a 30min of toil we reached the top of Alagalla mountain. 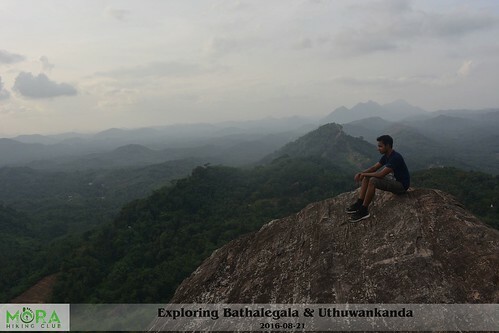 in this peak we could see the railway line below and Ihala Kotte station.